On Thursday, the Cultural Heritage Commission will decide whether or not to save 135 N. Western Avenue, a Koreatown building that housed the first See's Candy shop. Developers want to put a strip mall on the site, but preservationist Charlene Nichols nominated the building as a historic-cultural monument. Leaving aside the historical value of the building, does Koreatown need any more mini-malls? More via the press release: "Eighty-eight years ago this fall, Canadian immigrant Charles A. 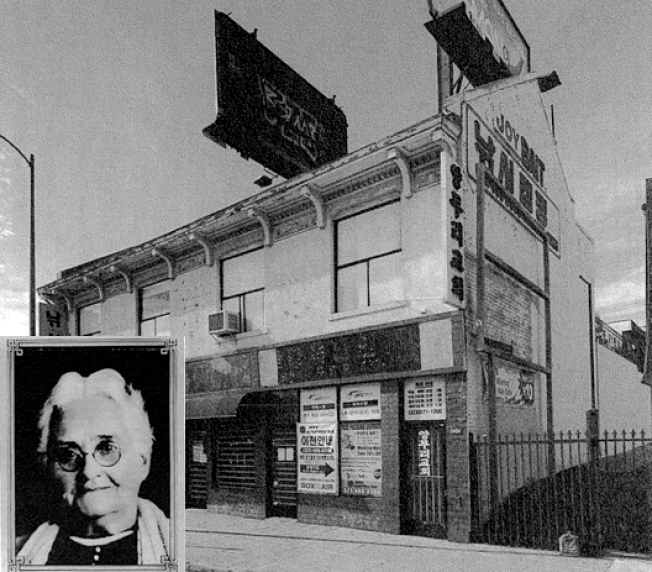 See and his mother Mary See (pictured) opened their very first candy shop and kitchen in a charming Renaissance Revival building at 135 N. Western Avenue in what is now Koreatown. See's current Los Angeles candy factory opened on La Cienega Blvd. in 1946. The building now sits empty and plans call for the destruction of its classical façade for a new mini-mall shopping center." WHEN: Thursday, February 5, 2009, 10 a.m.
LOS ANGELES - Just in time for Valentine's Day, Altadena archivist Charlene Nichols nominates the birthplace of See's Candies (Quality without compromise since 1921) as a City of Los Angeles Historic-Cultural monument. Eighty-eight years ago this fall, Canadian immigrant Charles A. See and his mother Mary See opened their very first candy shop and kitchen in a charming Renaissance Revival building at 135 N. Western Avenue in what is now Koreatown. See's current Los Angeles candy factory opened on La Cienega Blvd. in 1946. The building now sits empty and plans call for the destruction of it's classical façade for a new mini-mall shopping center. The City Office of Historic Preservation gave a staff report supporting the nomination and the city has received support letters from neighborhood associations as well as the Vice President of See's Candies who wrote "See's has survived some of the most dramatic decades in American history and we are extremely proud of its heritage. See's has maintained the classic look of the 1920s and Mary See's image will always be the symbol on See's Candy boxes...We hope the Commission will honor Charles See and the history of See's with a Historic-Cultural Monument designation of store No. 1." The applicant is Charlene Nichols, an archivist at the Jet Propulsion Laboratory near Pasadena and longtime fan of See's Candy. She once took a summer job wearing the famous white dress and giving out samples in the hopes that she could tour the famous See's candy factory. She lives with her husband in Altadena.